I would have never imagined a week ago a White Stork arriving on my local patch at Holmethorpe would only merit a patch tick. 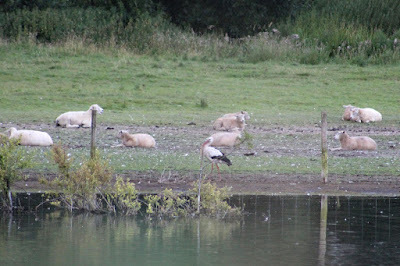 Most birders will be aware Beddington Farmlands has been visited by a second White Stork in recent days, a first ringed individual having turned up briefly on July 22nd. 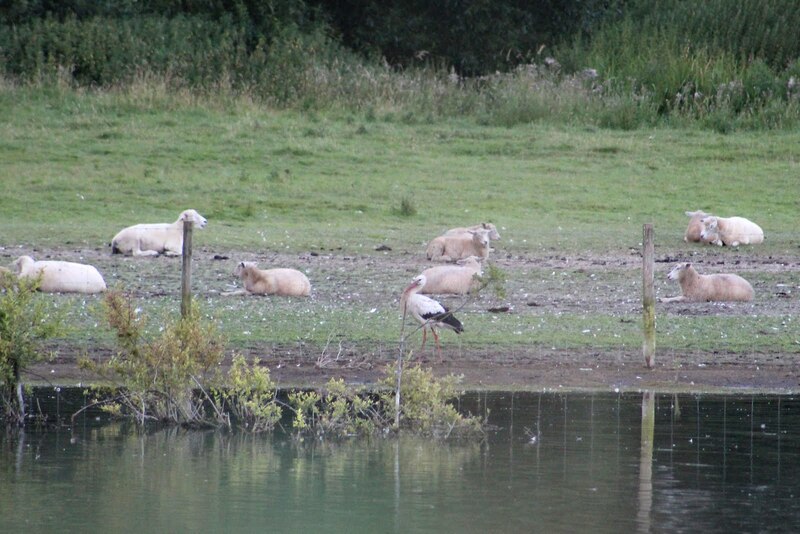 The latest White Stork has become a bit of a long-stayer, having been first seen last Tuesday. It had a habit of flying off in the evening and returning the following morning, so I went along on Thursday to catch it before I headed off for work. It's bad enough twitching birds, but worse when that twitch takes place at Beddington. I'm now not a key holder, so was unable to enter the inner sanctum of the Farm, which is only accessible now to a small group of birders. With no-one around it meant viewing the main lake through the perimeter fence. Not ideal. I had given myself an hour at the Farm, before driving to Croydon and taking the hit by paying NCP rates to park the car for the day. However, the bird, although seen during the early morning, chose not to come into view. Instead it waited a further hour to show itself after I had left. Bloody annoying. Undeterred, I went back the following morning, and after about 20 minutes I had my first view of a White Stork. It had a habit of wandering into area out of sight for a while, sometimes poking its head up above the vegetation, but at least I got decent, if slightly distant views of it. After an hour I returned back to base and caught the train up to London. 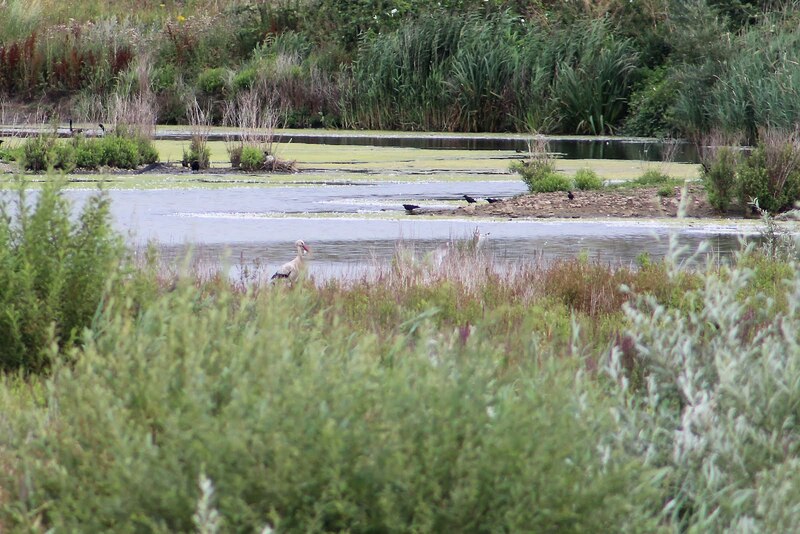 The Stork remained at Beddington until Saturday afternoon, when it flew off, heading south east mid-afternoon. So that was that, I thought. I was intending to leave for Sheffield yesterday morning for a motorsport event but was woken with a start at 5.40am when the phone rang. It was Gordon Hay. I didn't answer it for risk of waking Annie further, so waited to listen to the voicemail. In a very calm voice Gordon announced: "The White Stork from Beddington has just dropped down on Water Colour 1 on the muddy area at the back." Jesus H! From semi-torpor I was out of the bed and tripping down the stairs trying to put my jeans on. I was out the door in about five minutes, maybe less. The drive to the Water Colour Lagoons is all of two minutes, but it felt like an eternity. Thankfully, it was still there when I arrived to meet up with Gordon and Ray Baker, who lives at Water Colour and had similarly just woken up. Would you believe it? 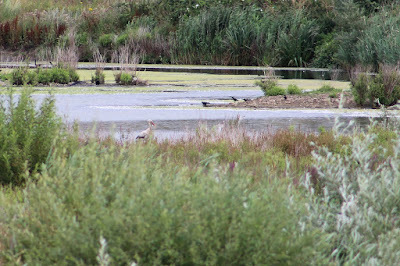 Here was the White Stork on our patch. Amazing! But strangely, neither Gordon nor I were as excited about this first for Holmethorpe as we should have been. And it was for the same reason. We had both twitched this bird up the road at Beddington and so we couldn't celebrate this scarce visitor to Britain as a first for either of us in Surrey as well as on the patch. The fact we had seen this bird already nullified the thrill. Nevertheless, it was an fantastic bird to see just quarter of a mile from where I live. We watched the Stork for about half an hour before it flew behind a tree. A walk round the side of the trees revealed nothing. We had managed to lose sight of a large white bird – we just couldn't find it again and presumed it must have flown off. Sadly, regular patch watcher Ian Kehl, who tours the site each Sunday with Gordon, was later to arrive than usual due to family commitments and didn't see it. He and Gordon continued on their walk around the area. 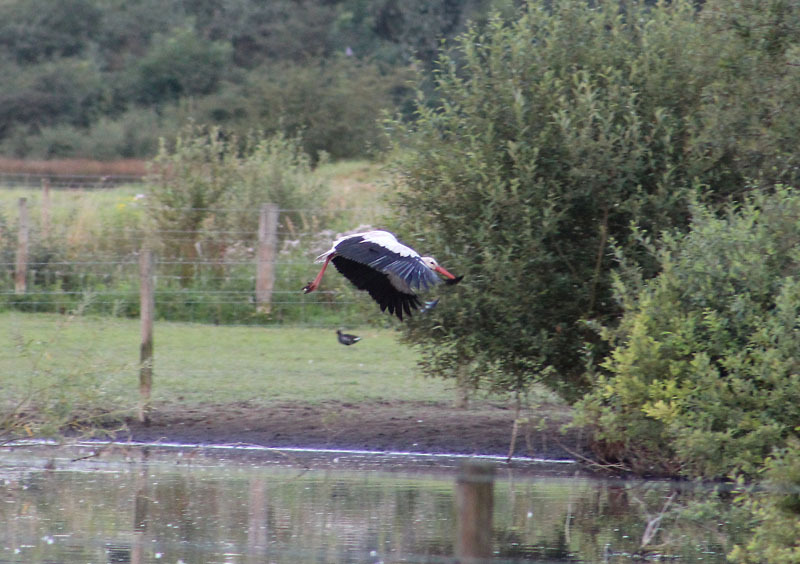 Another local birder, Ian Jones, arrived a couple of hours later to see the Stork circling the Lagoons before flying off. It went missing most of the day after that but has been relocated again back at its favourite haunt on the main lake at Beddington today.